You can see how this compares to past years, by clicking here. The final day started with at look at the new curriculum. In a nutshell, I feel that by far the biggest hurdle for chemistry teachers is going to be satisfying the audit process, and then making ethical decisions about what follows in their class. Although there have been some changes to content, I really don’t see how the content has been significantly reduced, and on top on the emphasis on inquiry, I find this all a little disturbing. 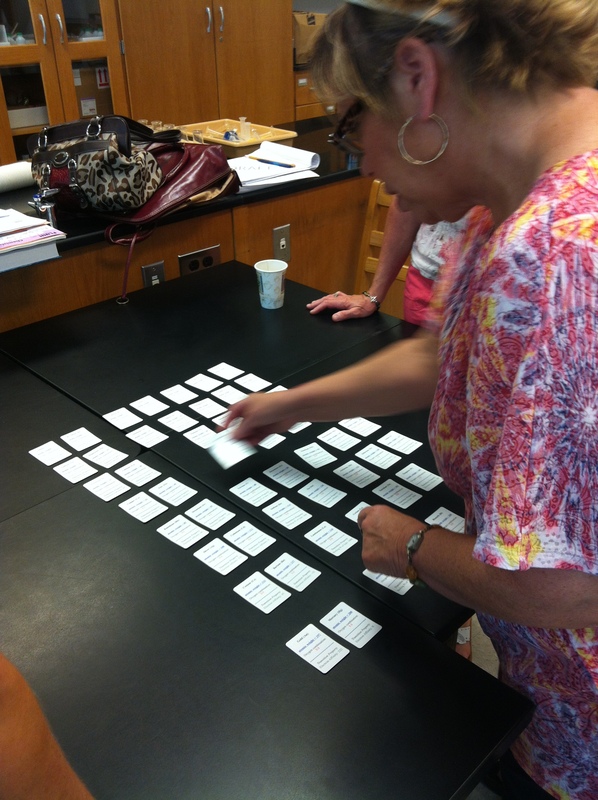 The second activity of the day was a look at an old favorite, Carolina Biological’s, Periodic Table Simulator. I like to show people this activity, since it has applications outside of the AP classroom, and it fills a void in a topic where there are precious few activities available. The 2012 Reading Notes and Comments were next up. I have a few connections that over the years have be generous enough to pass information on to me about the reading, and I usually compile them into a single document. The combination of that document, with a copy of the questions and my draft answers, usually provokes some interesting discussions – this year was no exception. 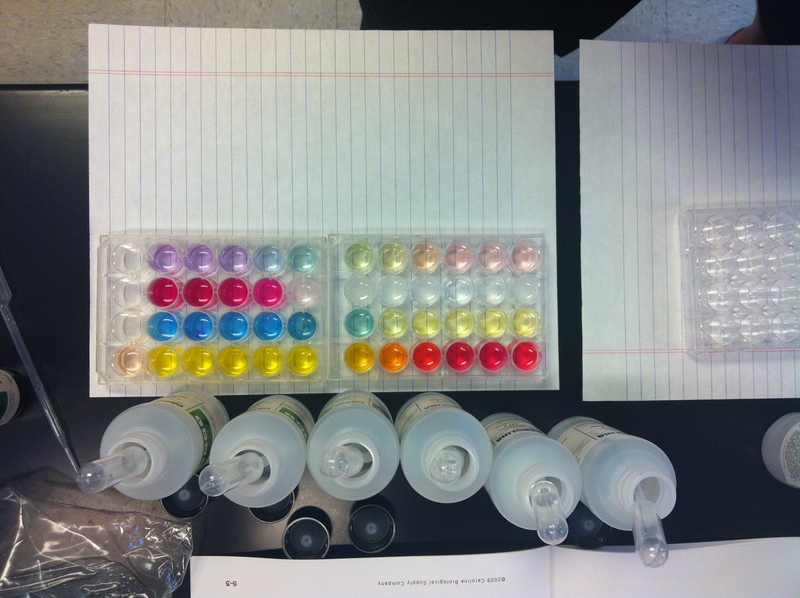 Next up was Big Five #4, Electrochemistry – plus FRQ writing to go with it. 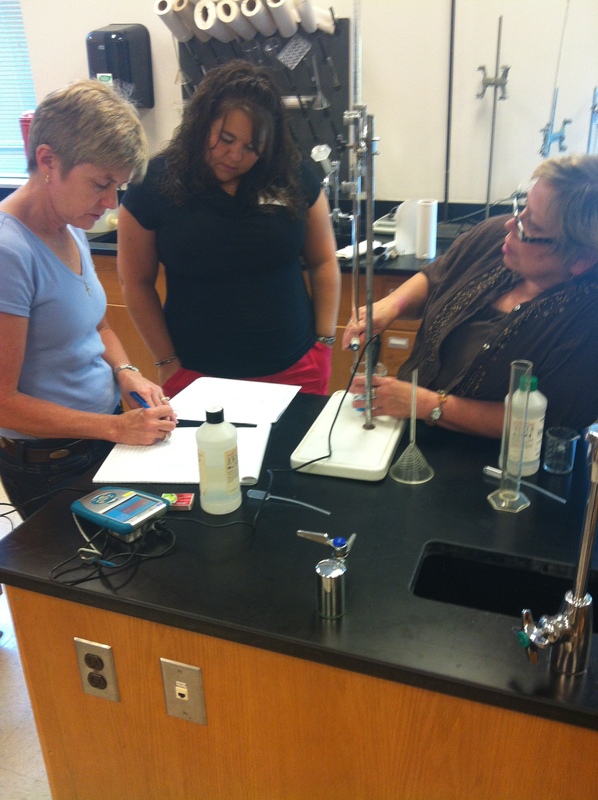 After lunch we discussed some common AP chemistry misconceptions. I developed this document from John Gelder’s original 2006 PowerPoint presentation, and subsequent discussions with him. Always an enlightening conversation. The final part of the day was spent reviewing a selection of lab kits donated by some of the chemical supply companies. Day 2 kicked off with some discussions about the new curriculum. I certainly don’t pretend to represent the College Board in any way, but I think I have a decent handle of things surrounding the new exam and course, and given that I am 100% independent, I can also give an honest, personal view of things! Granted it may not be totally unbiased, but I have no incentive to hold back on any opinions – a good discussion resulted! 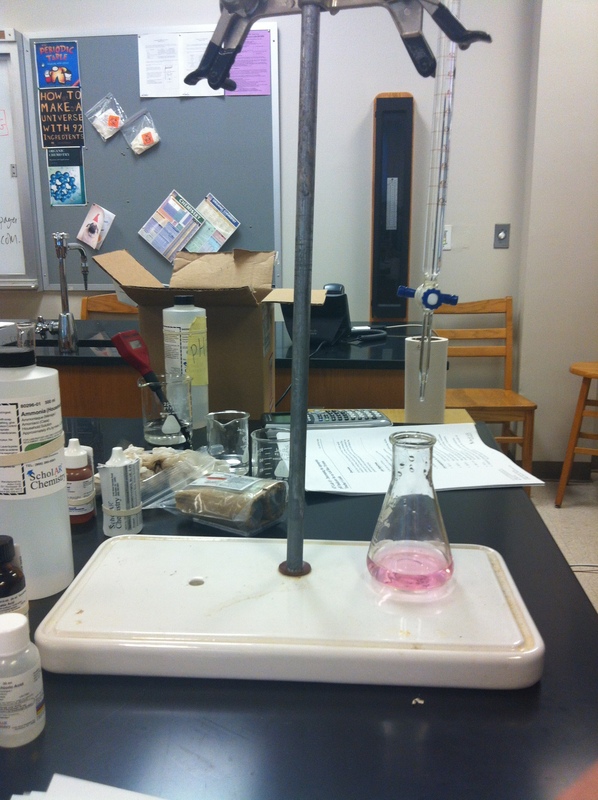 Next, Paul agreed to share a manganate REDOX titration with us, which led us to teaching points surrounding the writing of half-reactions, what constitutes measurements versus calculations, and a few other discussions about titrations in general. 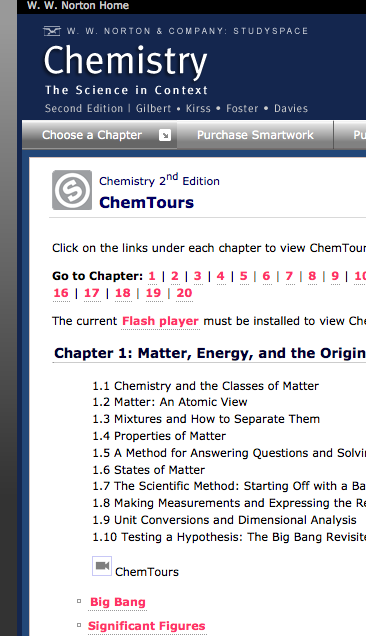 These general chats always bring up interesting teaching point to me, and as a small example of what I’m talking about we got into the pros & cons of adding electrons first or last when constructing half-reactions – sounds pretty trivial onthe surface, but I think it introduces some interesting ideas about what works for kids. 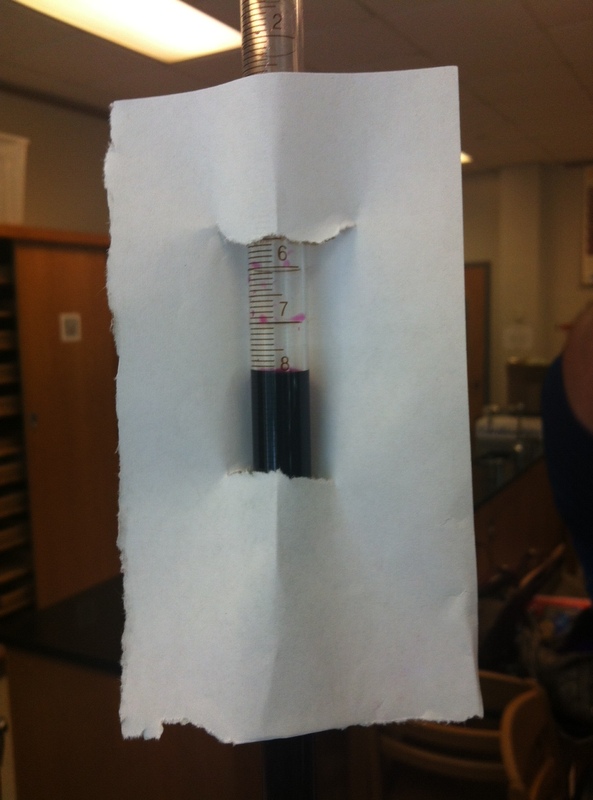 I used the old, ‘piece of paper to help the reading of the manganate meniscus’ trick, that people enjoyed! and then with one of Tom Greenbowe’s excellent simulations. These activities gave us a thorough look at one particular reaction that spawned some excellent conversation over a wider context. We then pressed on to the second of the ‘Big Five’, Equilibrium. A look at another simulation was followed by a brief FRQ writing session after lunch. 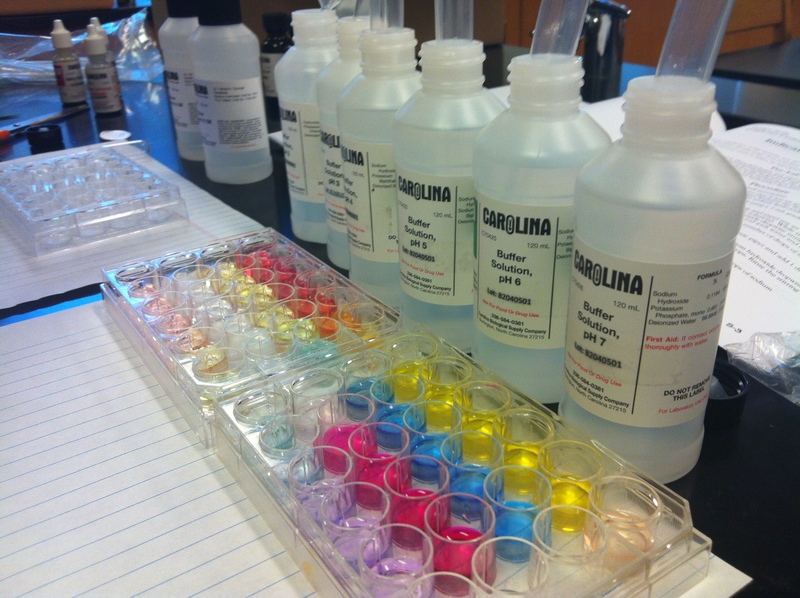 We then had a look a three Acid/base lab kits; One from Carolina, one from ScholAr and one from Flinn. All had pros and cons, but we could see good applications for all. Paul contributed valuable things again by giving us access to his titration calculation document, and we finished with a quick look at some more of the Acid Base topics, #3 in the ‘Big Five’. Eight of us gathered at 8.00 AM and went through some introductions. We have quite a diverse group, with experience ranging from 20+ years to just a few, and expertise and experience in middle school science, biology, math and a few other areas as well as chemistry. There’s a couple of the group with only one year of AP teaching under their belt, and some other folk with many more. 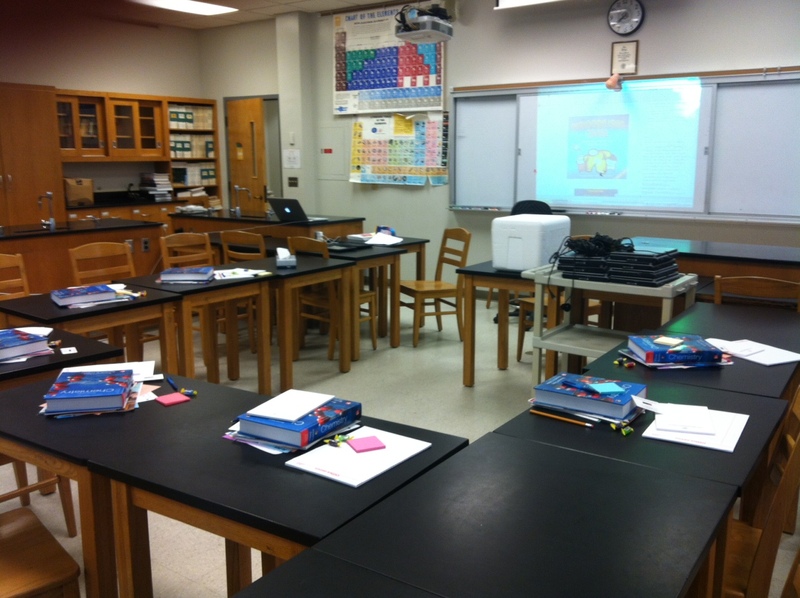 The first item on the agenda was my PowerPoint presentation, Teaching AP Chemistry the English Way. I generally like to start the workshop with it since it outlines some of my background and helps to explain some of my philosophies. This gives many of my thoughts some context, and I think helps to frame some of things that might come out of my mouth over the course of the workshop! It’s not a sales pitch, and certainly not something I necessarily say will work for everyone, but helps to explain me and what I do. After the opening remarks we then carried out a very brief, corporate style, SWOT analysis for each of our AP classes in the 2013-14 school year. We then moved on to tackling TOPIC #1 of the ‘Big Five’, Thermochemistry. We took a look at my bullet pointed study guide first, and then went for a very brief walk through of my notes on the topic. The next stage was to deconstruct a few AP problems with their teaching points, followed by a somewhat informal look at a couple of labs. The labs that we looked at were one of mine that is based upon many, many similar ones out there, where the enthalpy change of the combustion of magnesium is calculated indirectly from reactions of Mg and MgO with HCl, aplab09b. 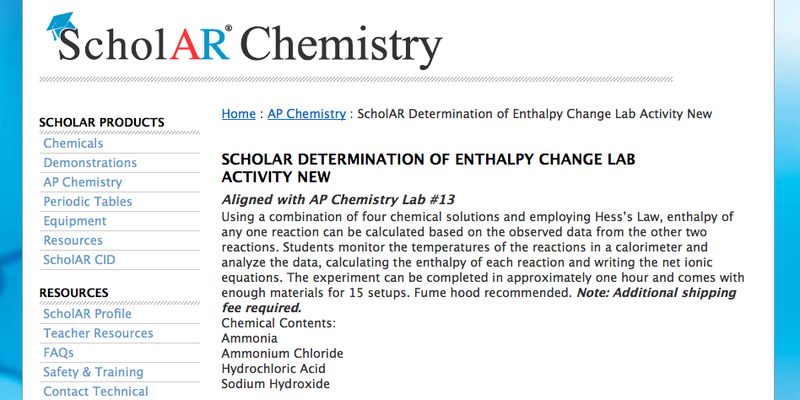 The second lab is from the ScholAR Chemistry series, #13 Enthlapy Change Determination, and is based upon an enthalpy of neutralization calculation. The lab work was followed by a Free Response Question Writing session before lunch, where we managed to produce the equivalent of approx. 3, free response questions that could be adapted and used with our classes. The UNFINISHED questions that we produced in 30 minutes flat are hardly perfect, but at least they form the basis of items that could be developed and used on our tests in the future – a take away for future use. 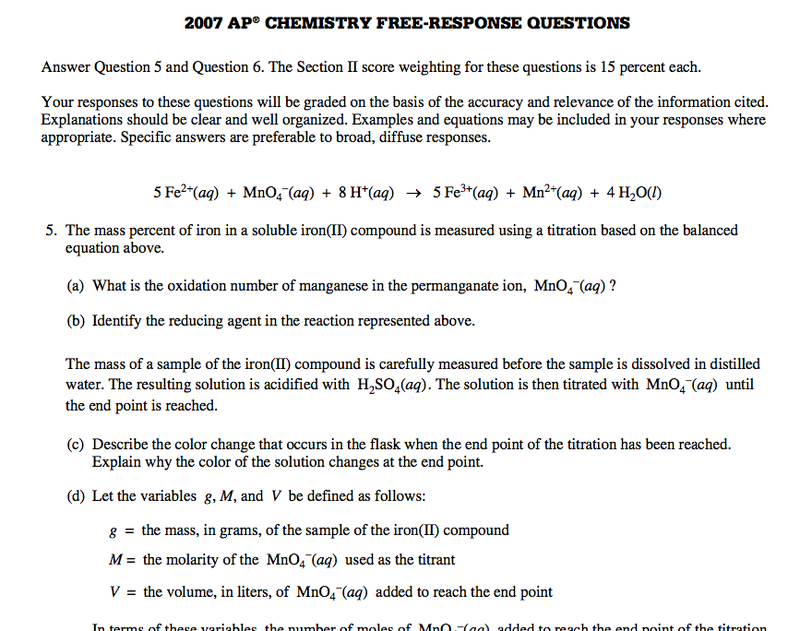 Lunch was followed by a breakdown of the multiple choice section of the 2008 practice exam from the College Board, with teaching points discussed rather than answers generated. 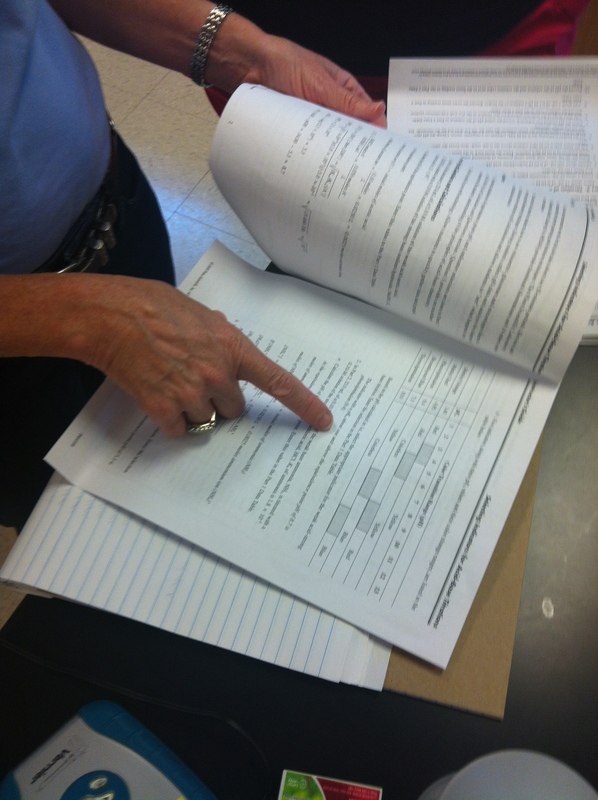 Stephanie then showed us a couple of things that she uses with her classes, including a reactions demo activity, and the rich resource associated with the W W Norton, Chemistry Science in Context textbook called Chem Tours. This looks like a really nice, FREE resource, especially if kids have been absent from school and need a little self-study option to catch up. There were a couple of really nice animations which looked very cool. A few admin things wrapped up a busy first day. You are most likely to be entering campus at the front gate (E2 on the map). Follow the road on to campus, passing tennis courts on your right, before crossing a small bridge. Stay straight (but bearing slightly to the left) at the first STOP sign (G5 on the map). Go up the small hill and at the next STOP sign (H6.3 on the map), turn right. After approx. one hundred yards or so, you will see a large parking lot to your left – park in there. We are meeting in R300, on the third floor of Robinson Hall (G7 on the map), the first building to the left of Adams Gate. I am attempting a paperless workshop for the first time this year, so please make sure you are bringing your laptops. I have a few options to cover a few missing computers, but not many! Of course, if need be I can generate some hard-copy versions of documents, but I would appreciate a heads-up if you are sure you will be without a computer. Thanks. One of the ways we can achieve this is to use the wealth of experience that you (the delegates) bring to the table and have ideas, techniques and strategies shared amongst everyone else who is present. This year will be no exception and I am asking you to bring TWO activities with you to share with the group. The floor is wide open here, and absolutely anything that you find useful could come to the fore. 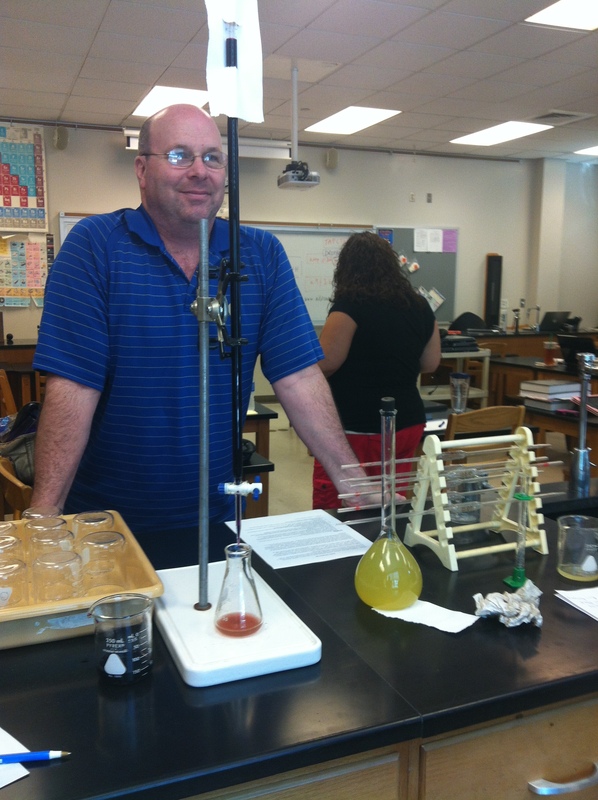 It would be great if we could actually see a few labs and demos (I can supply equipment and chemicals), but I’m also talking about worksheets, You Tube video clips, group activities, strategies, question sources, web sites, texts or anything at all that you use with your AP chemistry classes that helps you and the kids achieve meaningful learning. We’ll need some kind of digital format for the things you share, either in the form of a document, web link, blog post or some other shareable item, so please think about that aspect as well. The digital angle will allow us to collect all of the ideas in a single place, and build a small depository of ideas from the two workshops. I really need to know about what you are planning to share in advance, so please shoot me an email ahead of time with a few details. A few words will do, but we need a digital reference of some kind (either a digital copy of the material or web link etc. ), and if you would like to share a demo or lab (hopefully a few of you will), a list of chemicals & equipment. Thanks for taking care of this. Many times throughout the workshop I will refer to the 17 TOPICS that I initially identified when I first starting teaching AP Chemistry. Obviously you can choose to organize things how you see fit, with different titles, different content, different organization and different chronology, but for the purposes of our workshop I will often refer to the TOPIC numbers and titles that I use. Here's the list, purely for your reference.